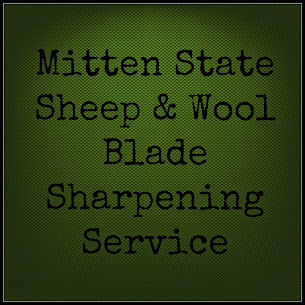 Mitten State Sheep & Wool : Why Border Leicester ? I would like to introduce our Border Leicester Sheep. I was just reading a message board where someone was asking why you chose the breeds of livestock you have. We have had Romney, Corriedale, and Dorset sheep living here at one time or another. 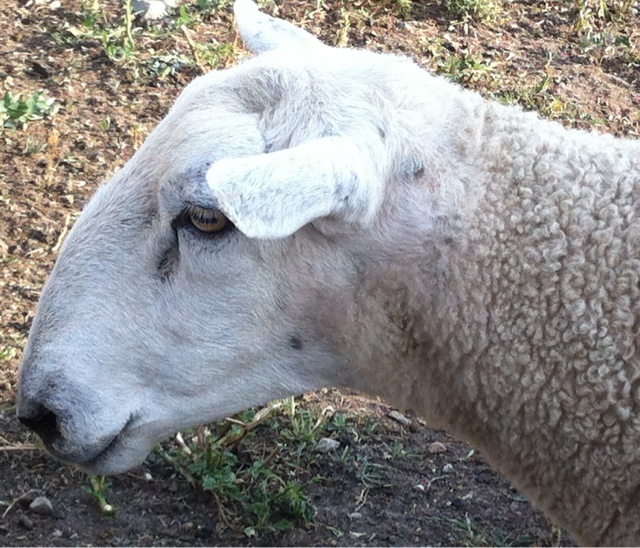 My daughter misses the Romney Sheep and I have to say there are times I do too. 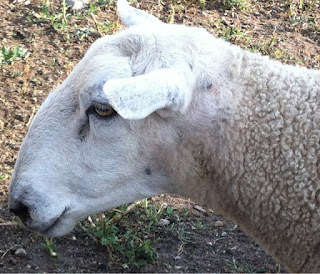 They were the first breed that we raised and you will find no sheep cuter than a Romney! They are an adorable, mild mannered sheep with lovely locks. Corriedale and Dorset have their plus side too so why did we end up with a Border Leicester Flock? I think overall we felt they just performed better for us. We raise our animals primarily on pasture, 12 months a year, so we needed a hardy breed. We wanted to be able to have our lambs in the spring without bringing them into the barn so they needed to have excellent maternal instinct. We wanted nice fleeces that we could sell to handspinners and that they have in abundance and in more than one color. We wanted lambs that would grow well on mom's milk and grass. So for us they were a very nice fit. We have not regretted that decision. Our Ram looking a little grumpy. He is not appreciating the high temps and no rain! I was very happy that she is natural colored. She has yet to get a name. I love sheep. 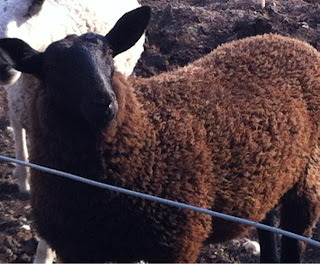 Your little black ewe lamb looks like my black ram lamb. He's a Finn. I have about half Finn and half hair sheep. 3 ramb lambs and 9 ewes now. It's been so hot here I think I'll need to get the Finn sheep sheared again. We sheared way back at the beginning of March. My 2 black sheep are miserable. We got our shearing done late this year so thankfully ours do not have much wool on them right now. We are hoping to shear twice a year something we have not done in the past. The Border Leicester Wool sometimes just gets too long with a 12 month clip. With your Finn sheep do you get a lot of triplets/quads? I love BLs too. I have BLs, and BFls and some crosses. I like to spin BLs wool. I wish you lived closer, my old White Knight is getting old and I will be needing to replace him. My daughter lives close to Hickory Corners and I have planned my visit this year during the Wool and Fiber Festival in August. I hope you enjoy the Fiber Festival! I am not sure if we are going to be able to go this year. Sandra, my 2 Finn ewes are just a year old. They both had singles in March and April. I am going to breed them with a Finn ram next time and I hope they have multiples. That would be nice. We shall see.